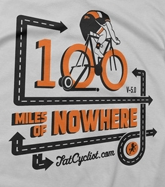 As previously mentioned, I’ve registered and am super excited about taking part in this year’s 100 Miles Of Nowhere. I was going back and forth about just how to knock down the 100 miles. Short course? Around the block? Inside on the trainer? So many options. Here’s what I’ve settled on and the reasons behind it. I’m going to go trainer, inside, all by myself. This is how the 100 Miles of Nowhere began, and because it’s my first foray into the event, I feel I should do it this way at least once. I plan to sign up every year from here on out, so I’ve got plenty of time to mix in other ways to ride 100 miles in crazy ways. Riding inside on the trainer also means an unlimited number of rest stops. I plan on keeping a stash of Clif Bars very near. And there’s a bathroom just a few steps outside my office. I plan on knocking out a trio of good movies or maybe a disc or two of a favorite TV show while I go nowhere as well. Being inside in front of a computer makes this an easier task. Finally, it’ll be easier to document the feat this way. Since my wife will be working and my dog can’t operate a camera (that I know of), I figure I’ll just set the webcam to record and have a full-length copy of my silly attempt at 100 miles. Which, I’m sure, I will snip down and share with the world on the internet, because that’s how you’re supposed to do things these days, right? I’m still trying to nail down a date. I want to have all my official race gear before I set off on the ride, so I’m probably looking at mid-June. My ride plan, as it stands now, is to do the Tour de Toad next Sunday. Then no events for the rest of May. June 2 is the Ranch Ride and June 9 is the Tour de Rock. I could go for the crazy three events in three weeks and do my 100 miles on the 16th. But, I think to allow myself time to rest up I’m going to tentatively pencil it in for the 23rd. We’ll see how that plays out. I haven’t actually registered for any of these other events, so plans are totally flexible at this point.